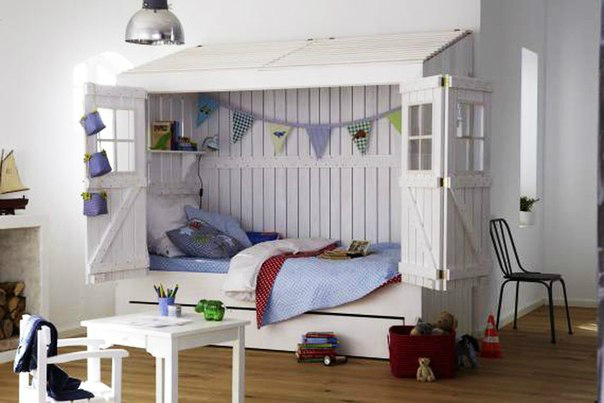 Make a fantastic kids room and add a spark of fun with a house bed. From the outside, like a child’s house with folding doors and inside a cozy bed. 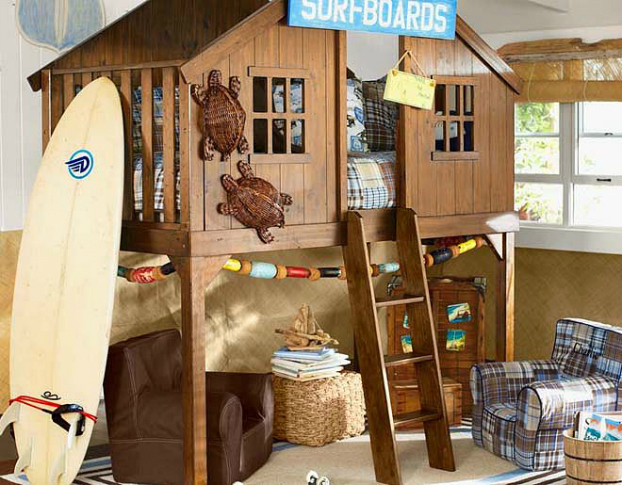 These 10 boys’ beds are really fun! Before publishing this post I asked my sons wich one they like. The answer was “All of them”! Every parent would love to give their kids the best kind of bed they can "afford". If you’re looking for boys’ house beds, you could be faced with scores of options. From twin beds to bunk beds to special loft beds, you’ll have several beds of different shapes and sizes to choose from. So whether you are trying to get a bed for your toddler or for your older boys, you’ll need a few facts to enhance your choice. Here’s a brief description of various boy’s house beds. A simple bunk bed has two beds – one on top of the other. Most bunk beds have two twin sized beds. But a few have a twin bed placed on top of a larger full sized bed. One of the nice things about most modern bunk beds is that the two beds can easily be separated, if necessary. You may opt for a bunk bed if there’s a need to provide bed spaces for two boys in the same room and you want to conserve space. A loft bed is a single bed that is raised up on supports. It allows you to make good use of the space underneath. For example, you can arrange a study table and a chair under the bed or turn it into a play or storage area. When buying this type of bed, it is essential to make sure that the bed frame and ladder are sturdy and firm. This will ensure that your kids don’t get injured when they jump on the bed. The junior loft bed is a loft bed that has shorter supports. The shorter height makes it suitable for toddlers and younger children. Beds like this usually have additional features like tents and slides for children to play and have fun. 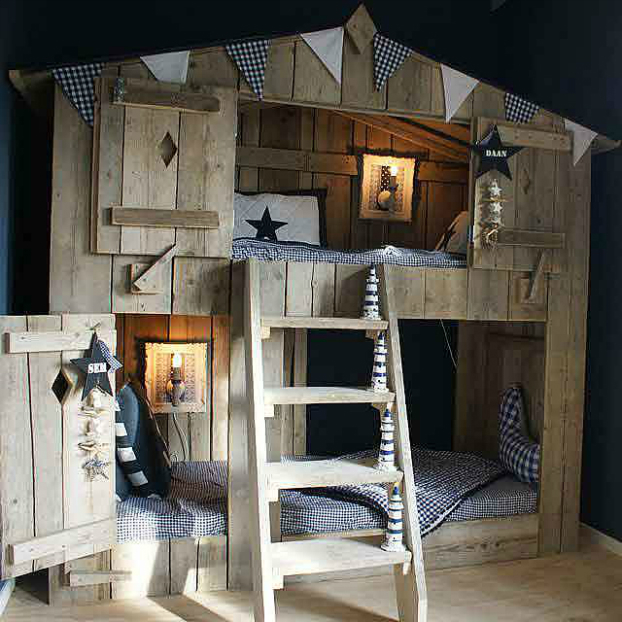 A themed bed is ideal for young boys. The design of this type of bed is usually based on a popular cartoon or movie. So if your boy likes Star Wars, you could buy a bed that looks like a space ship. The only snag about this kind of beds is that your kids could outgrow them. 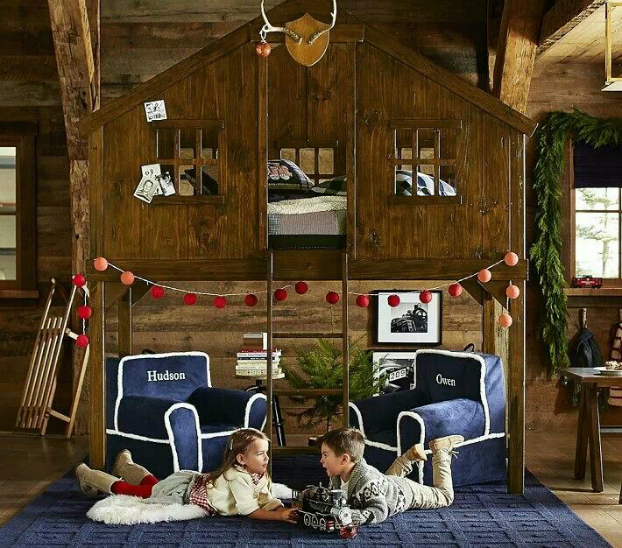 Treehouse loft bed by Pottery Barn Kids. 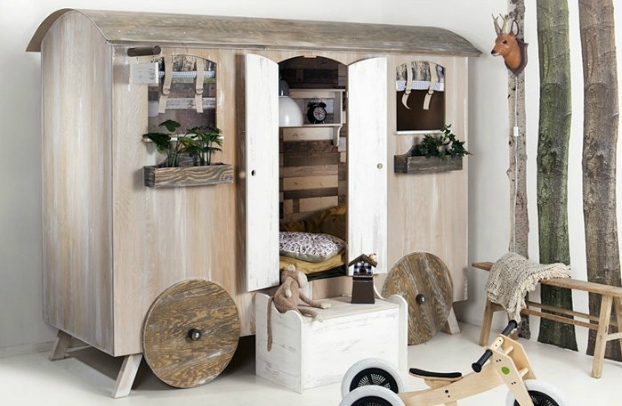 This magical retreat for your child evokes the spirit and appeal of an outdoor tree fort. The twin-sized bed sits above an open play area to double the space in the room.